Take Trans-Canada Hwy 1 North. Pass Goldstream Park and pass Petro Canada station. 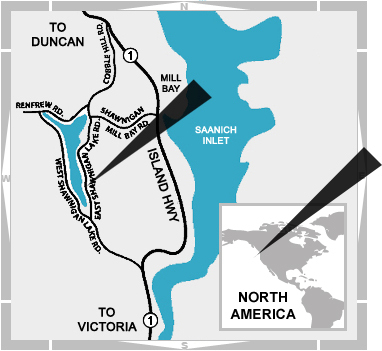 Notice sign for South-end Shawnigan Lake. Turn left at blinking yellow light. Follow Shawnigan Lake Rd. yielding right. Driveway on right side: 1869 East Shawnigan Lake Rd. Take Trans-Canada Hwy 1 South. Turn right on Cobble Hill Rd. Follow Cobble Hill Rd. until arriving at Shawnigan Lake. Make left at Shawnigan Lake Rd. Continue straight after 4 way stop. Pass Dwight International School and Easter Seal Camp. Driveway on left side: 1869 East Shawnigan Lake Rd.